To honor 150 years of serving humanity, Mayo Clinic is taking its story to the public in a free exhibit destined for stops in more than 40 communities throughout the U.S. and Canada from April through October 2014. This 1,000-square-foot exhibition on wheels will bring to life Mayo Clinic’s values and our vision for the future of health care. Our social media strategy to support this initiative involves a multi-platform approach. We plan to tweet our arrivals and departures, using local hashtags and host handles. We will also post geographically-targeted Facebook updates with photos, which will help us hone in on the audience most able to visit the exhibit due to physical proximity without spamming all our fans who may live states or countries away. Pictures from each location will also be coalesced into a Flickr album. We would like to invite all Social Media Health Network members to journey through our mobile exhibit at one of its stops along the itinerary. Afterward, it would be great to hear your feedback through signing our digital Guest Book. 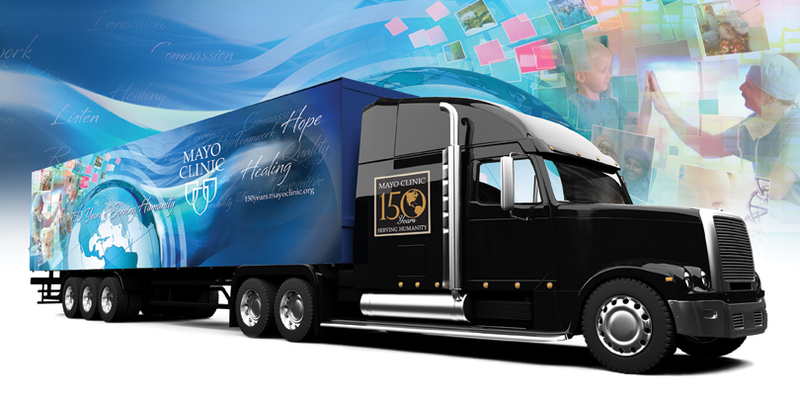 Finally, if the mobile exhibit is coming to your area, we encourage you to help spread the word on your social accounts, especially for the Mayo Clinic Care Network members that are hosting this interactive exhibit. It is an excellent opportunity for us to mention each other's accounts and collectively spread the word. See examples below. We hope to see you soon! To honor 150 years of serving humanity, Mayo Clinic is taking its story to the public in a free exhibit destined for stops in more than 40 communities throughout the U.S.